One thing that makes social media so attractive to businesses is the perceived price – Free. 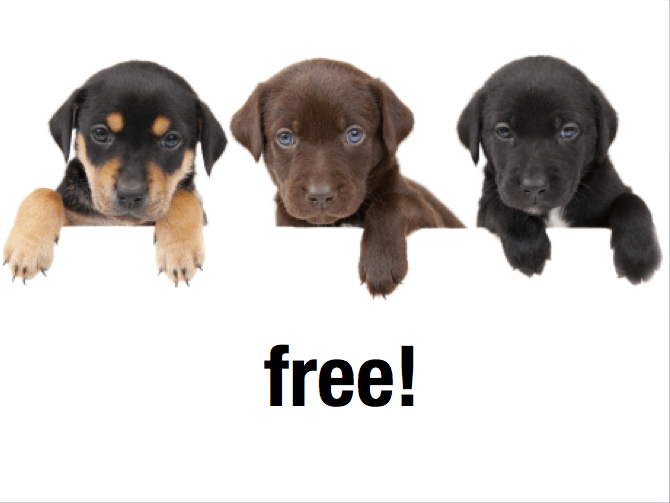 Sure access to most social media channels is free, but social media tends to be free in the same way a “Free Puppy!” is free. The real costs come after you assume ownership. Just like the free puppy, social media can require significant investments in training, feeding, nurturing, and even cleaning up a mess or two. This is an important concept to understand before you rush out and launch your new blog, fan page, or video site. Social media can be extremely effective, but it is not free. Every day, companies are lured by media hype and low barriers to entry to rush out and set up social media sites on free platforms without giving strategic thought to who will maintain these communication channels or what they are trying to accomplish with them. Armed with hope and a few ideas, they launch a blog, create a Facebook fan page or start a Twitter account only to quickly discover that using social media successfully requires work. The result is a digital landscape littered with abandoned, un-updated sites that, like broken windows on a building, send precisely the wrong message to the world. Social media takes time, energy, and effort. It is not like a traditional advertising campaign with a definitive beginning and a clear end, but rather an ongoing conversation requiring you to create compelling content, listen to consumer feedback, answer customer questions, and ultimately add value to people’s lives. To do this effectively requires developing a strategy for success, which should include information about who you want to build a relationship with, what your goals and objectives are, who will be responsible for various tactical responsibilities, and how you will measure success. In summary, when it comes to social media, make sure you know what kind of dog you want and why, how you’re going to pay for the dog food, the collar, and the vet, and most importantly, who is going to walk it every day before bringing home that free puppy. This piece was originally appeared in the June 2010 issue of the print publication Dayton B2B, where I contribute a monthly column. Because many friends and colleagues live outside of Dayton and many here in the area may have missed it, I republished the article here on my site.